This morning my dear son is wearing his Paris t shirt and his Strasbourg baseball cap. He is ready to see France! My daughter, despite weeks of practicing her one French sentence: “Excusez-moi, je voudrais acheter un chapeau rouge, s’il vous plait!” is staying on the ship with me and my niece. The rest of of our family disembarks after breakfast. I look forward to hearing their reports of Toulons! We tour the deck perimeter and the girls play shuffleboard. The rest of the family returns and there is some ping pong challenge. I believe it is declared that my sister-in-law reigns supreme on the court. (table?) They tell us of their adventures on the water taxis and walking around the port, particularly enjoying the percussion marching band they found. On this last night of the cruise, we celebrate Dear Husband’s birthday (the Asian “Italian” strolling guitarist sings) and we enjoy the prerequisite Baked Alaska on parade. This is kinda cool: lights are dimmed and the waitstaff parades around the dining restaurant with flaming Baked Alaskas. After dinner, I head to the karaoke lounge – I missed the karaoke opportunity, however. I do enjoy a beauteous sunset, whilst the hubby and all kids enjoy staff comedy hour in the Explorers Lounge. We pick up more souvenirs and gifts, as we admire the professional photos of the ship. It really looks awesome. Someday we will travel by cruise again, maybe it will be less hectic. We are required to pre-pack our luggage and have them in the hallway by 10pm. Hopefully we won’t oversleep like we did that first night! Looking forward to Barcelona! Buongiorno, Genoa! 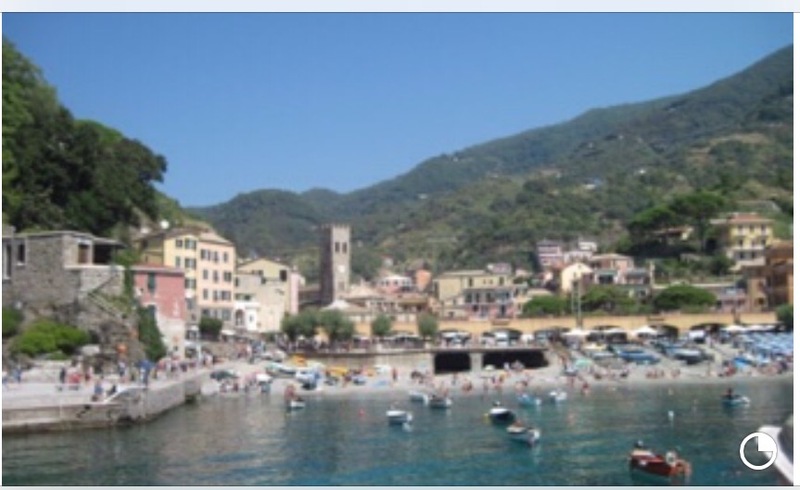 This morning we will be enjoying the ship excursion for the Cinque Terre. When one’s in-laws’ (who have generously provided for this trip) say to you “We adore the Cinque Terre, it has always been the highlight of our trips,” then you sign up. Brief breakfast buffet and disembark. Check. Even the littlest one proudly holds her own cruise card in her purse and shows it to the security guard. We have gathered in the explorers lounge to be assigned you our tour group. We are Brown 4. We board our bus along with the others in our group. The bus contains typical bucket seats in rows, upholstered in bluish hues. But there is one row facing backwards toward a table. The kids find this section. I’m seated with a pleasant fellow, who is traveling with his wife and daughter, who are in the row in front of us. 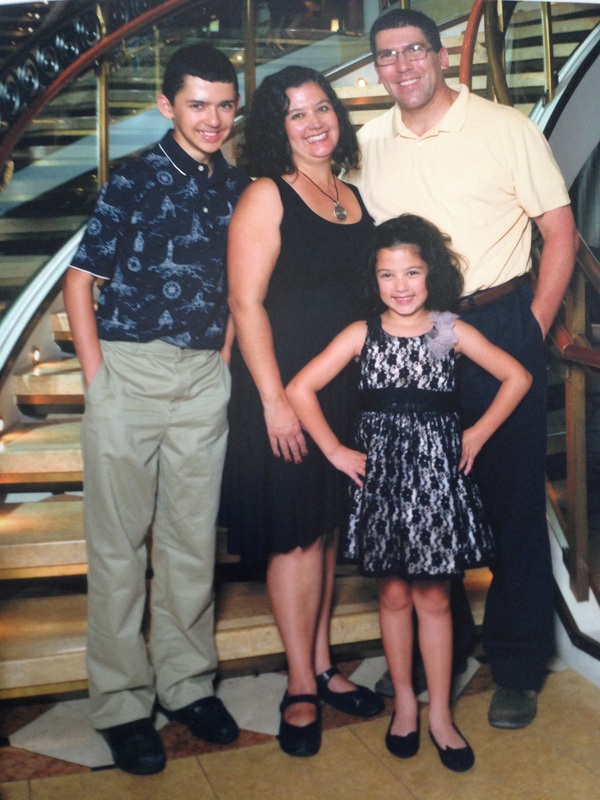 They are experienced cruisers and world travelers from Florida, this is their 13th cruise. At the first rest stop we invite the ten year old to join our kids at the table. My new friend joins his wife and offers his seat for my husband. 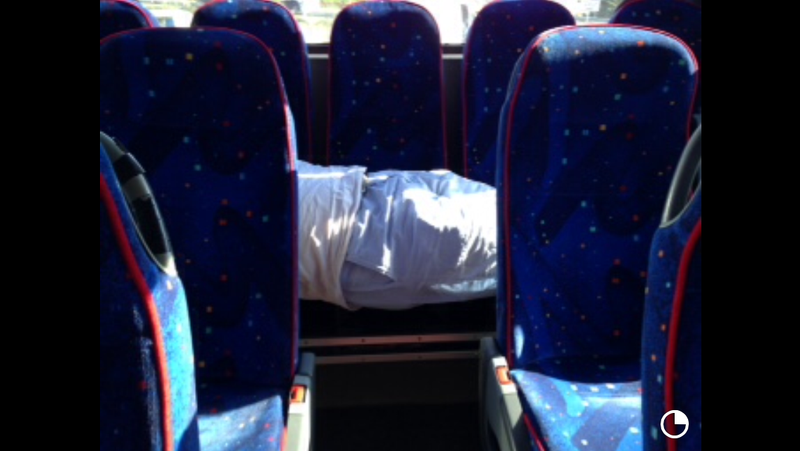 Which is very kind, but my husband has relocated and claimed the entire back row of the bus. It was very nice making new friends on this excursion. 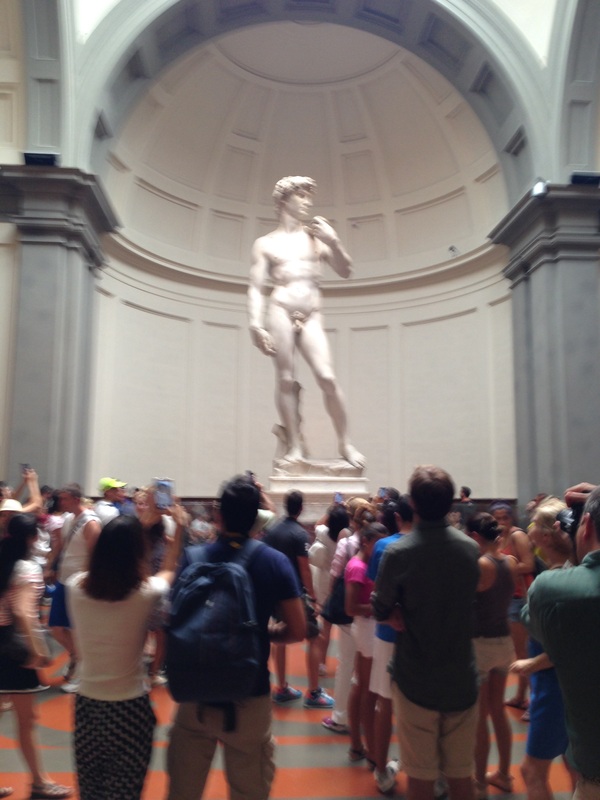 The tour guide is a delightful young Italian woman with a sweet accent. I am reminded of the tours I have taken on my other travels- the Bullet Train in Japan and the Road to Hana in Maui. Our group is about thirty in total, which is not bad, except for that we are one of five groups all going to the same places at the same time. So when we get out, walking among the masses and trying to identify and keep up with our group is a little more stressful than it should be. The CinqueTerre are delightful; they are five colorful villages that comb the cliffs and slide into the ocean. CInque TerreI am reminded again of my favorite book that I read every year: The Miracles of Santo Fico. The bus parks at one village and we walk down the hills to the water. At the bottom of the hill is a popular swimming hole: and we enjoy watching the inhabitants frolick. A restaurant with outdoor seating is beautifully set up, but as it is only morning, no patrons yet. I’m taken by the lovely cobalt blue accents in the decor, when I notice the restaurant name reminds me of the characters in my book. I snap pics of the sign and the mural. My daughter will paint her version of that scene tomorrow. Meanwhile, we watch, fascinated, as a modern conveyer system pushes out a boat and lowers it forty feet to the water. We have some free time before our boat departs, but it’s really too hot to think about taking the little stroll they recommended. So we wait. There’s a short jaunt to the dock and we board a little ferry, along with more brown numbered groups. The wind of the sea feels fantastically refreshing as we head toward our next village. Here in Montorosso, we have a brief introduction and then time on our own. The church is strikingly decorated with black and white marble, arranged in stripes. I am so moved by a large painting, I literally moved when I photographed it. Alas. My in-law’s prefer a slow, fancy lunch and bid us adieu. We find a bar/cafe called FAST and so we duck in there. The names of the sandwiches have rock band references. The old building is so charming with its cracks, and then there are large flat screen tv’s blaring music videos and Italian news. I enjoy a caprese salad, as you do. All the burgers and whatnot arrive together, and I remind the waiter I had ordered a salad. He seems astonished that I even mentioned it, and says it is being prepared. Code for, Relax, you crazy American lady! Afterwards, we venture around a bit and find ourselves at a gelato shop, hits the spot. Hubby and his sister look for the wine tasting, and we head back toward the meeting point. There is a cute playground, we take some pics of dear daughter on swings and slides and whatnot, then we run out of the sun. I find postcards and the cashier says “bye-bye” to me in a funny way: it is too loud and uncomfortable on his tongue, and I wonder if he has seen that skit on Saturday Night Live. 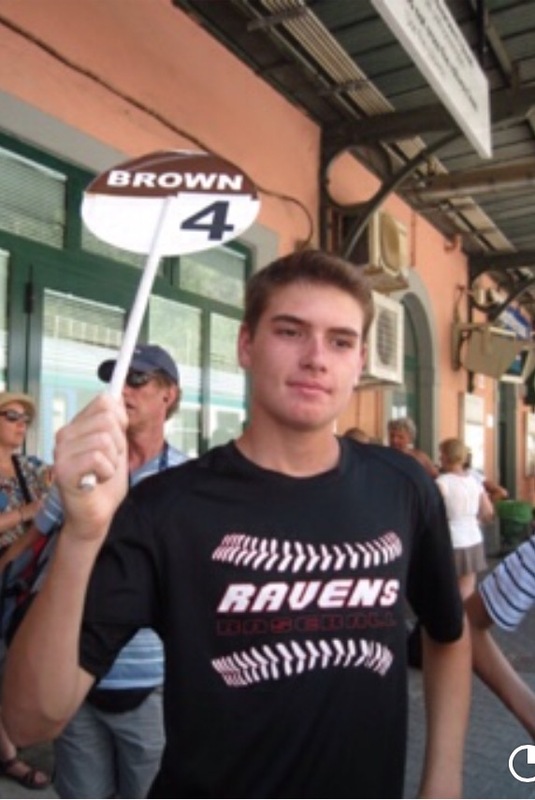 We walk to a train station, and as our guide purchases our tickets, she asks my tall godson to hold her sign. He begrudgingly obliges. 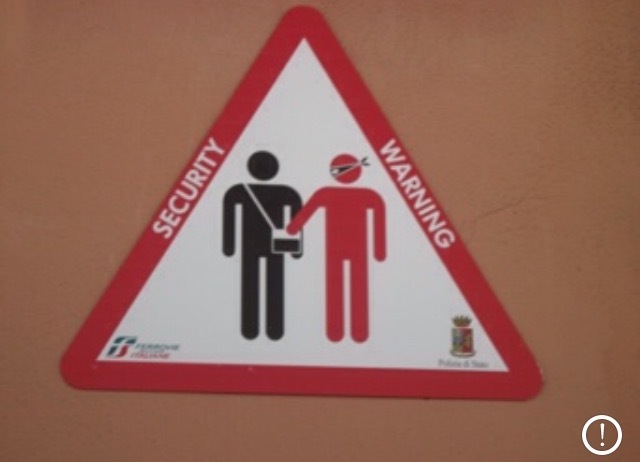 We observe the security signs and find them hilarious. Ninja’s might steal your wallets, apparently. We herd onto the train and ride one stop to where our bus awaits. We are exhausted in the afternoon, as is our custom. The ten year old has been to many of the places depicted in my daughter’s world traveler coloring book. They select a page and take turns coloring. Upon embarking the ship, we detour to the international cafe. I have been trying to use up my punches on my coffee card, but they keep giving the kids free drinks. There are worse problems to have, right? Tonight is another formal night on the ship. We dine in the formal dining room and enjoy our entertaining waiter again. After dinner, we split ways and the girls wait for the balloons to drop in the atrium. It is half an hour before they do, but it’s fabulous. We watch the one lonely cruise employee whose job it is to cut the strings holding the balloons in the net. It is fascinating to me to think that these crewmembers work and live on the ship for ten months at a time, sending money home to their families. They have their own cafeterias and pool on the lower decks. And I think of the Star Trek: Next Generation episode “Lower Decks.” Meanwhile, “YMCA” and “Celebration” play as our little dancers grow tired of dancing. And then the golden, pearlized balloons fall from four levels above.Balloon Drop That was cool. 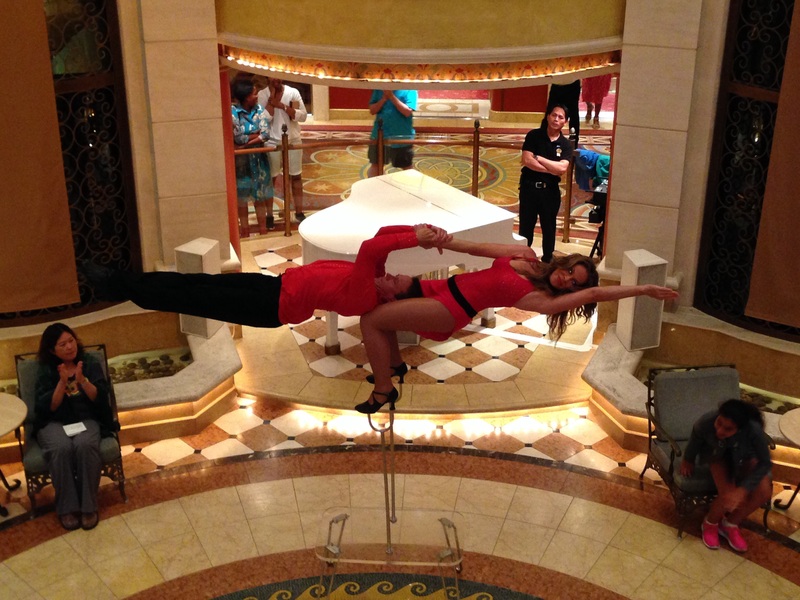 The fabulous tango acrobats are performing again this evening, we are so lucky! The eveningtime is our regular ritual: I get the girl showered and in bed first, then godson brings my dear son back to the cabin, and he does his thing. I have my black forest frozen mocha and check in with my friends and family via text. Tomorrow is our only day in France: Toulons. I think my daughter and I are going to stay on the boat, however, and watercolor. I am so excited for today! Florence is going to be my best day, I just know it! We wake and eat breakfast in the buffet again, this is fun and quick and efficient. We fill our water bottles, although there is a sign saying not to, everyone is doing it. As we disembark with the extended family, I can’t help but notice this port is different, there’s plenty of decorations and information kiosks, as well as places to just lounge around. Happily, my dear father-in-law had prearranged drivers with Italy Limo for our family, and they are holding up signs with our name. I had pre-booked our museum reservations online ahead of time, knowing we will have minimum time in this beautiful city. Surprisingly, and yet not surprisingly, none of the other family members want to go to the museums. We are separated into two cars, as our party of nine is too big for one vehicle. We are all going to Pisa, first. I’m kind of hoping for just a quick stop, click, and go, but our friendly Italian driver will have none of that. We enjoy the drive from the port of Livorno to Pisa, alongside numerous beauteous fields of golden yellow sunflowers. There is traffic heading back toward the port, so our driver asks again what time our museum reservations are. Pisa is charming, and we take many of the prerequisite photos of the leaning tower. The church is beautiful, old, and sweet. It is already getting hot. After choosing cool shirts for the kids at the street vendors, we head back to the cars. Our driver is friendly and funny, his English is pretty good, and we communicate well. 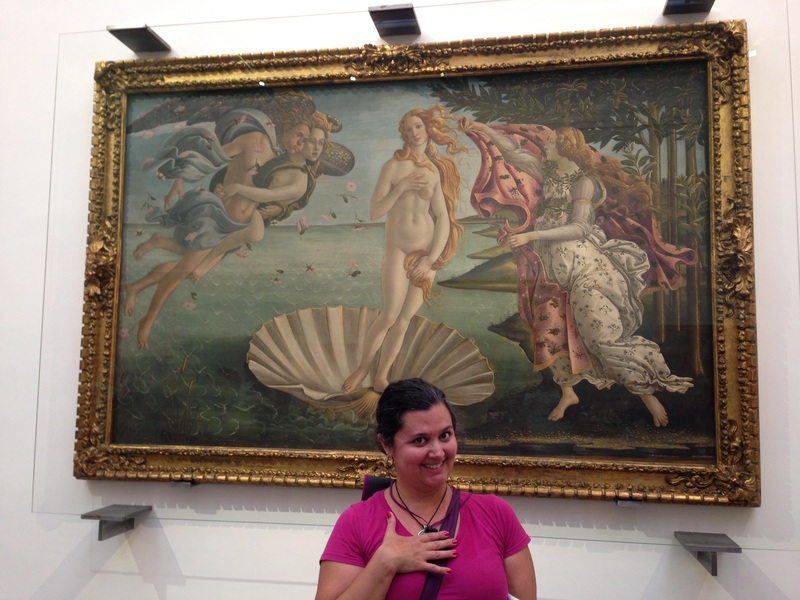 As we leave Pisa, Andrea sings “ time to… say goodbye…” and I am delighted, as I love that song and Andrea Bocelli. Our conversation is about Andrea Bocelli, Elvis, rock music, and the movie Airplane! I am asking him who the patron saint of Florence is, but he says “I do not understand this- patron?” I say, you know, how Rosalie is the patron saint of Palermo- he says, “Ah! Pa-TRONE!” I am reminded how you have to sing the Italian words, or else they are not understood. Entering the walled city fascinates me. We don’t have walked cities in San Francisco Bay Area. Our next stop is the wonderful lookout that is Piazza del Michelangelo. This is a fantastic vantage point over the city of Florence/ Firenze. The city with its terra cotta rooftops and the Duomo is just fascinating. I am delighted to take some photos of the Ponte Trinita, where my brother–in-law proposed to my sister, more than a few years ago. There are street vendors and gelato stands, we enjoy some gelato before we separate into our two cars: my family in one. The whole morning I am trying to plan lunch but everyone else keeps telling me not to worry, and when I should go to lunch. SO annoying. Andrea drops us off near our first museum, the Accademia, where Michelangelo’s David is housed. Turns out there is a long queue to redeem my reservation confirmation and obtain actual museum entrance tickets. I have to provide all of our passports at the ticket window, as well. 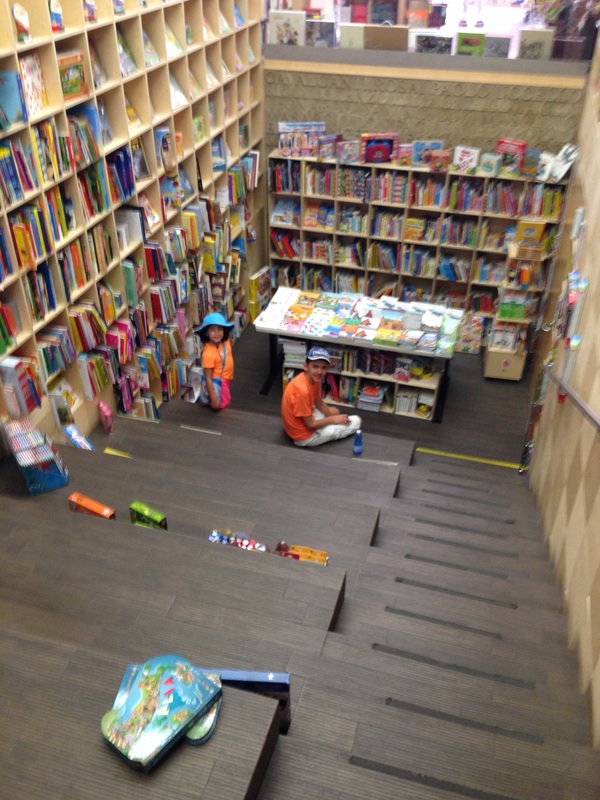 The kids have found a delightful bookstore adjacent. How I long to spend time in there, myself, but, Andiamo! There are more paintings to discover, and they remind me of the Greek Orthodox Byzantine style: religious content trimmed in gold, irregular shapes. And a bonus, for this music lover, there is a corridor of ancient musical instruments on display. It is always wonderful to see the pianoforte and harpischoird-type instruments that are precursors to what we now know as the piano. There are also percussion instruments, including circles of bells and pre-tympanis. We are only there about an hour when it is time to leave. We now have only a small window for lunch, so instead of looking for anyplace famous, we duck into a street bar playing fun dance music, where we enjoy pizza, calzone, and cannoli. There’s a lovely square with a carousel, but all we have time for is snapping a pic of my daughter smiling in front of it. 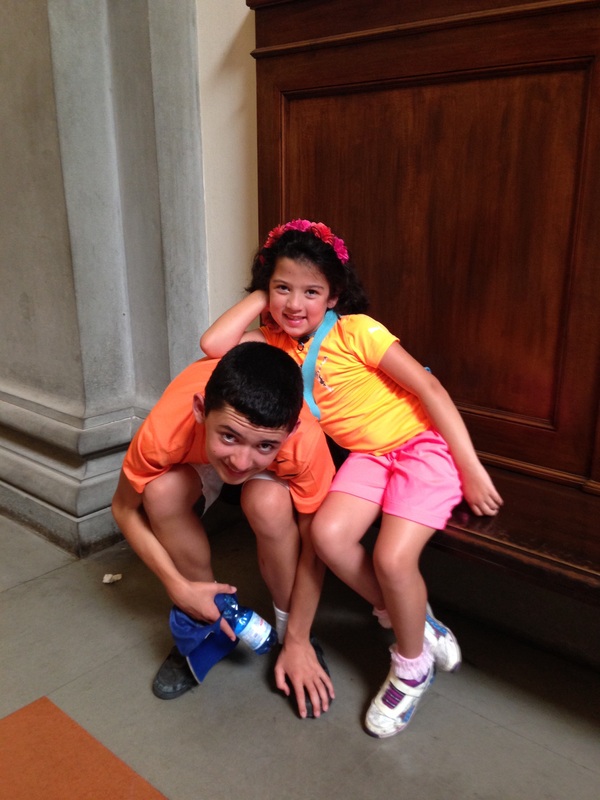 We walk amid the streets toward the Uffizi. There’s another line for redeeming my reservation confirmations, but I got this. The family gets in the entrance line whilst I redeem tickets. Had we not made reservations online, the wait would be around the block and half a day. I had already decided which halls and exhibits I wanted to see, and my husband lets me lead, that is, after he leads us up seemingly endless flights of stairs in this heat. I’m studying the map and I know where I want to go. The rooms are clearly numbered and we begin in the Italian section, very unfortunately the math/cartography room is closed, but one of the Italian rooms has been relocated to another room on the other end of this U. I am delighted seeing Boticelli’s Birth of Venus, she is spectacular in all her glory (and behind plexiglass). Hubby takes a pic of me with Venus, doing the pose, but he takes it landscape. Ah, well. At one end of the U-shaped corridor I take photos of the city, and of the bridges. Ponte Trinita lies just behind the more famous Ponte Vecchio. Sadly this is the closest I will get to it. 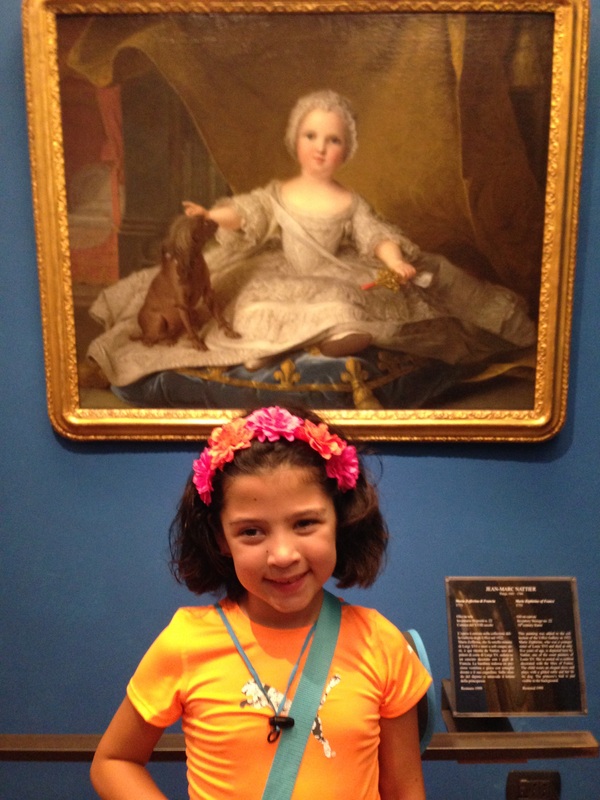 Downstairs are the French rooms, and one sweet portrait of a young girl dressed in a lovely silver, lacey dress. This is the only painting that the seven year old has asked about and commented upon all day. We take photos of her beside the young girl. 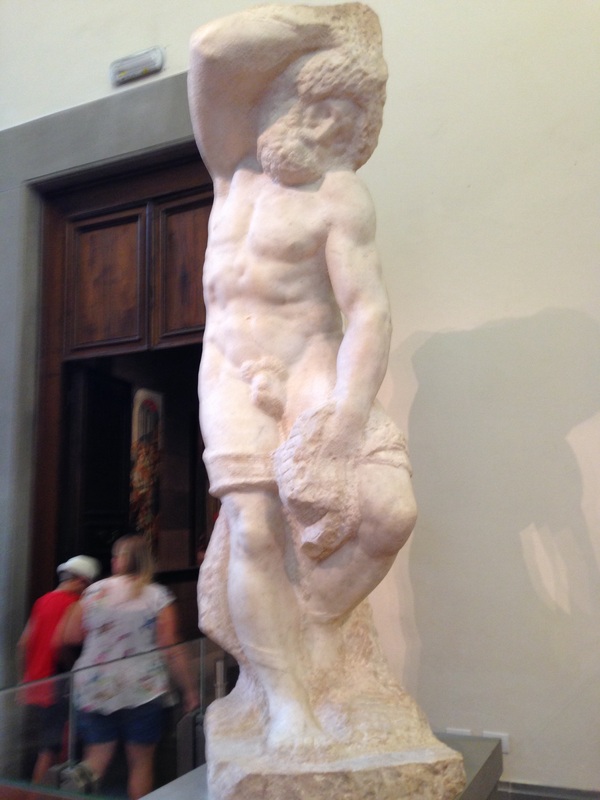 We hardly saw a fraction of the Uffizi, but I loved every minute of it. We exit trough the gift store, and although they are out of the Dress-Up David magnet, we pick up Boticelli’s Venus magnet, complete with traditional Renaissance garb and Wonder Woman attire. We stroll through street vendors, picking up postcards and another shirt for hubby. We admire the chalk masterpieces replicated on the street, including the Girl with the Pearl Earring and Mona Lisa. We meet Andrea at the designated meeting point and he hurries us to meet the rest of the family. The drivers are not willing to take us to my bridge, for fear of the traffic observed this morning. The family seems annoyed with us for even asking. Apparently they did nothing special after lunch and gelato, wineries were too far and so they just waited for us. The head driver says he will concede to drive us via the adjacent bridge, and I can take photos from the moving car. Forget, it, I say. 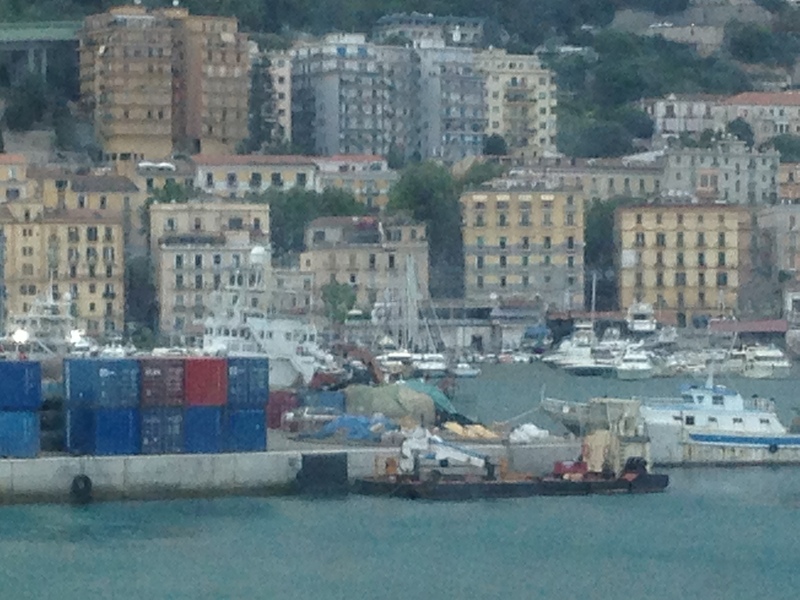 We all know the cruise ship won’t wait for us, and our drivers do not want to drive us to our next port of Genoa. We head back to the Port of Livorno, dear hubby sleeps in the back seat while the kids entertain each other by whispering and hushed giggles. Finally at our port, Andrea says, “ I am remembering the Minions, they are saying BOTTOM! Eet ees funny!” We all LOL. We are too tired for fancy dining tonight, my in-law’s opt for casual dining and we opt for the buffet again. There is some basketball challenge, in which my fifteen year old godson challenges my dear husband. Hubby returns to the stateroom, and he looks like he’s dying. I am tempted to remind him that he’s thirty plus years older, but I bite my tongue. He says: I don’t even know where to put my sweaty shirt! I say: OUTSIDE! And it stinks on the balcony. He showers as the rest of us head up to the buffet. It’s our first time going to the buffet for dinner, and it’s okay. Somehow I did think it would be better, but it did not knock our socks off. 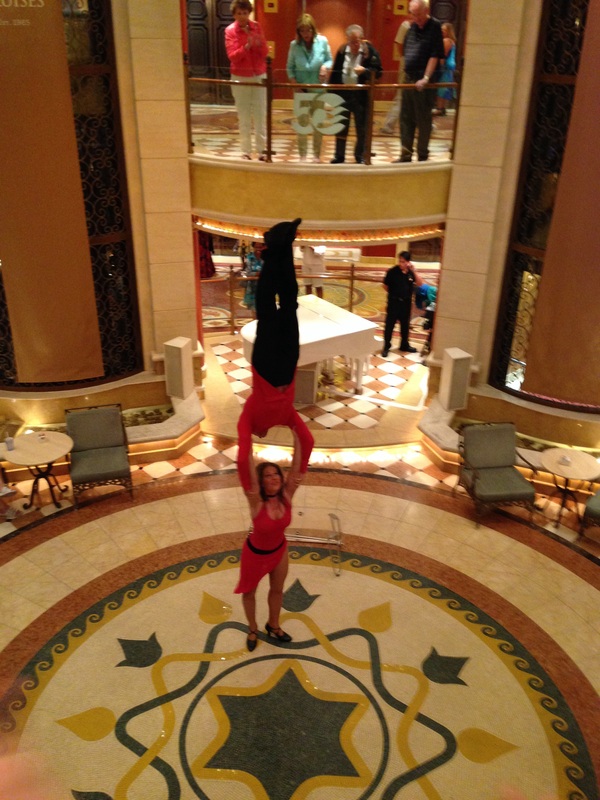 We toodle around the ship afterwards, and catch a absolutely fantastic performance in the grand atrium: two acrobats performing to Moulin Rouge’s “Roxanne” outstanding, eye-popping feats of balance. This really did knock my socks off. I urge the rest of the family to catch the encore performance at 9pm. And it’s another evening of bedtime routines. Tomorrow will be the Cinque Terre excursion from the Port of Genoa, and another Formal Night on the Emerald Princess. Today is a day At Sea. This means there are no port stops, no excursions, and we are free to explore the ship, and all she has to offer. My daughter wants to attend Kids’ Club, so we have a quickie breakfast in the International Café and I sign her in. They give me a pager. I haven’t carried a pager in over ten years. Then the rest of us have brunch at the buffet, and the kids want to swim. My husband works on his laptop and does our laundry (yay! ), the grandparents do their own thing, and my sister-in-law take the remaining kids to the pool. I pick up my daughter for lunch, and she has painted a t shirt, as well as pictures for her cousins. She states very plainly that she does not want to go back for the afternoon activities, as her partner earlier spoke only Spanish and also the chairs were too small for her. So, to the pool! For lunch, we feast on pizza by the pool. The cheese pizza is fantastic, actually. I keep having to go back in line for more slices for everyone else. The two boys, two girls, and two moms, I don’t want to think how many slices we all ate. The pools are surprisingly small, although there is a generous ultra-shallow area for just sitting. One pool shows a movie, and the other has a live band. I’m headed to the Lotus Spa for my massage reservation. This is pretty nice, the massage therapist is nice and friendly, and when I admit I’d never had a hot stone massage because I was scared, she gives me just a little teaser of a couple hot stones, and it’s not bad at all. (Not at all like that episode of Amazing Race.) My sister-in-law wanted to bask and read in the Sanctuary, the posh adult-only area, however we are dismayed to hear that entrance to the Sanctuary costs extra. I use a “house” phone on the pool deck to request towels be sent to my room. They cannot figure this out. But you are calling from deck 15? But you want the towels to be sent to your room? Omg. The towels never come. This evening we will be celebrating my in-law’s 50th anniversary. They have made a reservation at Sabatini’s, the fancy restaurant on the ship. Prior to our dinner, we will be having an hors d’oeuvres party on our balconies, in theory. In actuality, although we can connect our two balconies, it is again drippy sweaty humid crazy hot, and so we decide to stay in my in-law’s stateroom. Their stateroom is no bigger than ours, and now we have nine people in it! We bring in our two chairs from our room next door, so now there are 4 chairs and 4 people sitting among the two twin beds. My daughter shares a seat with me. If someone wants a drink or some chips and guacamole, they have to get up, squeeze by all the people, and go to the TV column table. Everyone is in good spirits, although the setting is a bit ridiculous. Fortunately, the AC, open balcony door and open cabin door create a kind of wind tunnel. My husband happily sits in the chair nearest the door and in optimum wind tunnel lane. Finally somebody suggests we head down to the restaurant. Brilliant. After the two hour dining experience, we roam the ship a bit and I buy batteries for my camera again, plus my nightly coffee drink treat. And it’s another night aboard the Emerald Princess. I manage the kids’ bedtime routines, and Dear Husband checks into the casino again. After my son is showered and in bed, I begin my daughter’s routine. She flushes and the toilet overflows. Fortunately she was going in the shower anyway. I get her in the shower and use all remaining towels to clean up the floor, fortunately it is only a foot and a half square (you think I’m kidding, ), and not much overflow. I manage to call the customer service desk and obtain quick service. Yes apparently the keyword for quick service is “overflow.” They ask if it reached the carpet, I say no, please send someone and also I need towels (still). They come so quickly and turn off the main water to our cabin before knocking on the door. “Oh, no!” I hear my sweet daughter say. I explain to them that they can’t do that, my kid is in the shower and needs the water, and no nothing got on the carpet. She finishes her shower and we modify her routine so I can get her up to her 2nd level bunk as I let in the gentleman worker. He is accompanied by a female supervisor who informs me that “flushable” wipes are not really flushable. Got it. Somehow my dear son sleeps through all of this and dear daughter falls asleep easily. Dear hubby has not responded to my texts, as texts are wonky on the ship, but also men don’t answer their phones and/or they let their batteries die. I am wishing I snagged a mini bottle of wine from the party next door. I’m too tired to deal with the crazy two-site 3 page login process to get my wifi minutes, so I just use my remaining texts for the day and text my family and friends. Some of them text back, and that makes me happy. Tomorrow will be my best day: Florence! I am so excited. This makes me happy, too. Today is going to be a great day! We have private family tours lined up for Pompeii and the Amalfi Coast. We grab breakfast at the buffet, which is okay, there are a lot of offerings and it is quick. The buffet is near the top deck, and we have to hustle down to Deck 4 to disembark. As we walk down the ramp, we see people holding signs. Always a comfort when on a foreign country, seeing your driver holding up a sign with your name. Actually there are two drivers, as we must split between two vehicles. Our first stop is Pompeii. Our friendly driver secures a site tour guide for our little group. As I am not entirely sure about the little one being at Pompeii, I brought along her paints and markers just in case we need an alternate activity. But our guide is perfect, he is knowledgeable and friendly, and he takes a liking to our little one. His English is very good, and his accent is charming. Of course, the weather is crazy hot and humid. At least one person out of the nine of us is likely heat fatigued at any time. Fortunately no one is outwardly grumpy. Walking through the village of Pompeii is really kind of trippy. I remember having seen a television mini-series about the volcano when I was a child, and that freaked me out. I understand that at some point the plaster casts of bodies in distress were on display throughout the site, that is no longer, thankfully. Being in the village and observing how some structures are still standing is mind-blowing. Our friendly tour guide is knowledgeable about the society and compares it to our own. Theaters, marketplace, hot food vendors, etc. He does purposefully distract our youngest child as we walk through what was the brothel. (I don’t even think the older kids were paying attention to what it was.) He teaches her how to be a tour guide and she tells us where to go next. We pass by the ruins of hot food vendors and they enact the marketeer selling a dish of hot food. She asks for macaroni and cheese, of course. He smiles and explains that they didn’t even have potatoes back then. We snap some cool pics of the kids in the street, but they are not really “with” us. Near the end of our tour is the area where we can observe the plaster casts of the bodies, so our guide bonds with the little girl again. Seeing the plaster casts of bodies is most unsettling- we see a baby, a dog, and of course, adults in their moments of death- some in prayer. I am glad the 7 year old is not with me as I tour this last area. My ten-year old says it makes her sad. But it is important to honor the history and culture. We return to collect our daughter who is now forever friends with our tour guide David, he has taken a photo of her Italy flag-painted nails and requested her permission to post it on his Facebook page. She gleefully agrees and pretends to sign her name on an invisible contract a la the Little Mermaid. In the forum we observe the Mount Vesuvius in its post-eruption state, and I try to imagine it as it was in its full glory. It’s not hard to imagine this sweet village populated. It is more than a little sad. Now we return to the vehicles and drive the Amalfi coast. Our drivers are courteous and friendly. Each moment offers postcard-picturesque views, the blues and hues of the water kissing the beaches, rocks, and quaint little towns. 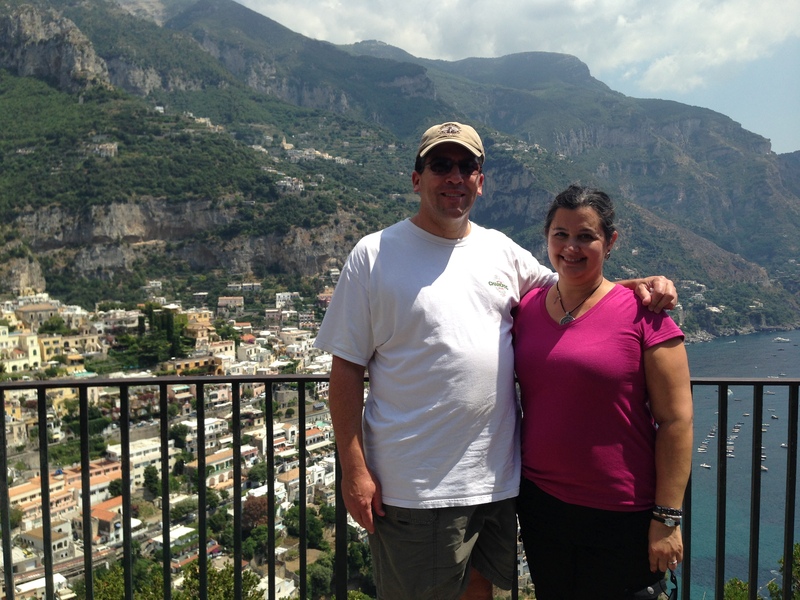 We stop for pictures at a lookout before Positano, such an amazingly beautiful scene. I am delighted as this town especially, reminds me of one of my favorite novels which I reread every year. The Miracles of Santo Fico by D.L. Smith takes place in a fictional village, much like this one- off a winding road, steps and hills, houses that seem to tumble into the sea. 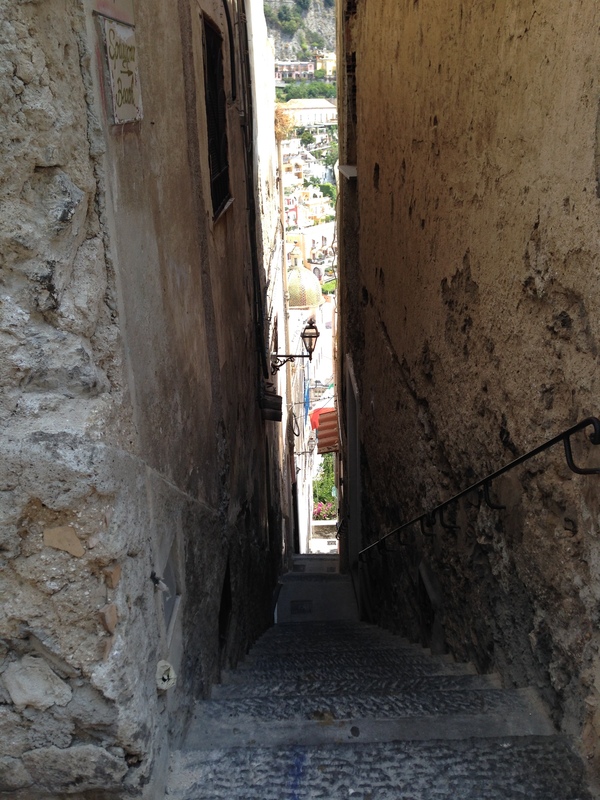 Tour busses cannot enter the town of Positano, as the streets are too narrow. But we have two Mercedes cars, so we are good. Our drivers bring us in as close as they are allowed. And we walk down the rest of the way. I half expect to see my beloved characters from Santo Fico around every bend. In a way, I do. For there are shop owners, villagers, restauranteurs and children among the tourists. The long incline includes many steps, some ramps, some streets. We are descending in droves- down, down, down. And it’s hot, hot, hot. I’m loving this, and I’m looking forward to our special lunch ahead, but I am also thinking about how Dante descended to the depths of hell in the Inferno. Soon we arrive at the bottom, where we have reservations at a restaurant on the beach. They are full, so the seat us outside, but there is some shade and more importantly, there is a big industrial fan sweeping the area. Our long table includes a pillowed bench at one end, this is where my daughter chooses to sit. She’s so cute in her aqua hat, perched among the blue and yellow throw pillows. Ordering water is always a bit confusing, as two of our party prefer the bubbly bottled water, some prefer bottled water, and some of us prefer tap. I order gnocchi, which almost seems a bit silly as it is so hot, but it is delicious and I am so glad I do! I buy souvenirs at a cute store across the street. The cashier offers a friendly extra-loud “Bye-Bye!” as I leave, which strikes me as funny. I wonder what the villagers think of us. As we walk back up, there are more people coming down. There are even some small vehicles coming around the bends. For all the crazy driving we have seen, we have never observed any accidents, so I guess that is good. We duck into a shop and attack some pastries, we share a cannoli among our family. We pick up more waters here. Some of us switch cars so we can mix up the company. Driving along the coast again, admiring the scenery, I marvel at how the kids (at least the ones in my car) are sleeping. We board the ship and it is Italian Night! After refreshing, we make our way to the Botticelli dining room where the staff is outfitted in striped gondolier’s shirts. It is only our third night dining, but our head waiter and staff remember our preferences, and even our names. As one of our family has food allergies, the Maitre D’ offers to preview tomorrow night’s menu, so they can prepare anything especially for him. Our family takes up an entire round table. This is a relaxing time for the family, everybody talks with another and the kids are more like themselves, having fun with each other. Maybe that’s why it takes so long. It doesn’t seem like a two hour meal, while we are there. We look at the photos taken on the cruise so far, I pick up another frozen black forest mocha for my evening treat. Tomorrow is a day at sea. I am looking forward to swimming, my massage at the spa, and also we will need to do laundry. I get some wifi time, and since I didn’t use all my texts today, I can text my friends and family at home tonight. I miss them dearly. Sunday, the first full day of our cruise and we oversleep. I awake from deep slumber at NOON, when out friendly steward knocked on our door. Holy Cats! We were supposed to be on a formal ship excursion. Oops. I wake up the family. We are amazed we slept so long, but then we have been traveling non-stop since last Thursday. I admit I hadn’t set an alarm, because my children are always up at seven, like clockwork. Not this time. Later we learn that our family did knock on our door, as well as text, but texting is sketchy and doesn’t always work. In the meantime, we decided to try the buffet for lunch and then adventure into port on our own. I’m glad we overslept. We are on our own, in Palermo, Sicily. Fortunately, this port is in the heart of the city, unlike some of the ports which require transportation sometimes up to an hour to the destination city. We step off the dock and it’s a beautiful day. I have the ship port printout in hand, and that’s all, really. We spontaneously hire a horse-drawn carriage and see the sites in the city from this vantage point. My dear son rides up front with the driver, hubby and I share the formal seat, and our dear daughter rides on the jump seat, facing us. And it’s perfect. Our guide takes us to about a dozen stops in this charming port town, in almost two hours. Highlights are the corner of the four fountains, the massive post office, Teatro Massimo, a sweet park with lots of cool banyan trees, a cool parade float honoring Palermo’s patron Saint Rosalie, another square, and an exquisite cathedral. 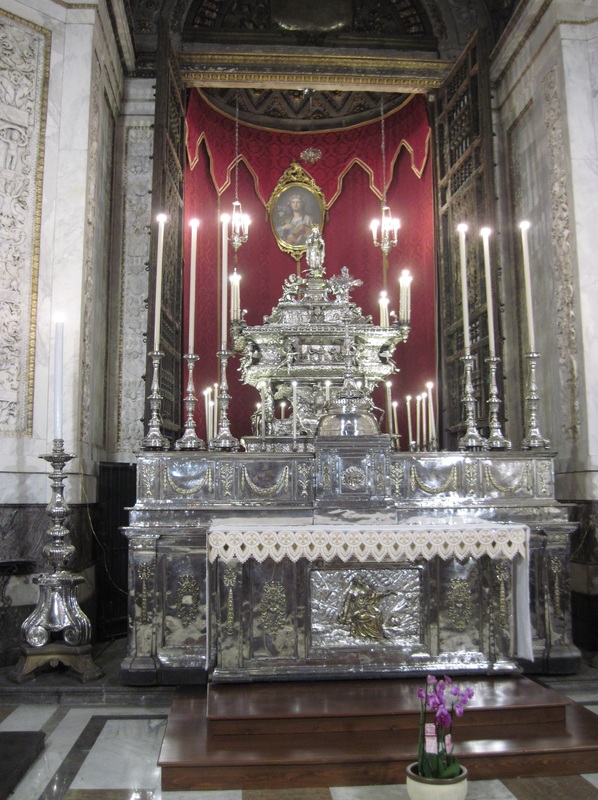 This chapel I will forever remember, as a side altar honoring St. Rosalie was beauteously adorned with the most silver I have ever seen. We aren’t allowed to use flash photography, but you almost do not need a flash, for the silver is so plentiful and bright. At the end of our excursion, the kids and I get postcards near the port, hubby has to haggle with the driver, there’s some confusion over the hourly rate. Luckily we will later be credited our unused excursion. Oh- and housekeeping increased our air conditioning airflow, not quite on par with our favorite Las Vegas suites, but much improved. We learn the secret to folding up the kids’ bunks on our own, now we can stow the bunks when not in use, and walk around without bumping our heads. We move one table and all our life jackets to the balcony (which it is really too hot to enjoy), and have increased more space. Every bit counts! We are like a new family. Air conditioned and well rested. We look forward to meeting the rest of our family for dinner, so we can compare our adventures. Tonight is formal night. I had suggested to our dear daughter that she pack her Cinderella inspired dress, she said no, thank you, she wanted her black lace dress. Dear son looks dapper in his fancy polo and khakis, Hubby wears a polo and dress pants, as well. I am wearing a cool black sundress, which is not fancy, per se, but a little fun jewelry and it’s all good. Most people are a little more dressed up than we are, and that’s okay. It’s kind of fun to “dress up” and see everyone else all fancy-like. We look forward to taking more family photos after dinner. At dinner we learn that our family did attempt to reach us in the morning, when we were dead to the world. Since we didn’t answer any knocks, they figured we were already at the meeting point or were on our way. I had only received one text from our godson in the afternoon. 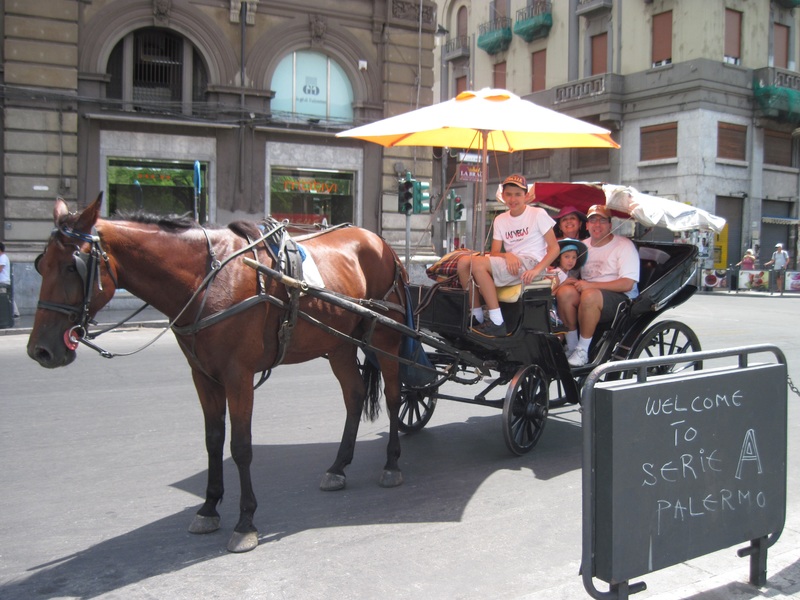 Theirs was a formal cruise excursion, including a bus to another town, a walking tour, free time and lunch, and a bus drive through Palermo prior to reboarding the ship. We gather that some of our family members are not happy with us for not going with the group as planned, and some are even jealous that our adventures were more fun than theirs. Only a little awkward. Dear Daughter orders again from the kids’ menu, and again selects the best dessert on the table. The Love Boat Volcano is a brownie banana sundae with whipped cream, cherries, fudge, and rainbow sprinkles atop. Funny how dining takes so long. There’s drinks ordering, bread, entrees ordering, the wine arrives and wine bottle-opening rituals ensue, more bread, entrees arrive, order desserts, order coffees and after-dinner drinks, charge coffee cards for the specialty drinks, charge cruise-cards for any specialty wines or sodas. I will enjoy steak for five out of our nine nights of vacation, because, when in Rome…! Since we are all dressed up, we pose for photos, as you do. With nine of us it takes a bit of time, first one of the clan, then one family and then the other, and then the grandparents, now each of them solo a few poses, now my husband and I, oh look, now one parent with one child, etc., etc., etc. We actually do this in two locations with a backdrop, and then on the actual winding staircase of the Grand Atrium. This photographer is a bit pickier about head angles and hands in pockets, and standing feet together with one foot pointing forward. We later see him at the photos cashier, and dressed in a Roman costume as we disembark at one of the ports. In between the photo shoots, we break and explore/ obtain internet minutes plan for the ship, as well as a coffee card, stop by the sundries store for yet more AA batteries. During this time I happen to run into my in-laws, on my own. I comment on how my nephew is different this trip: he is Too Cool for School. They realize how his interest is affecting all the other kids. It is what it is. There is a risk of traveling with so many kids of different ages and various abilities to appreciate culture and history. At least they are having fun with each other. I bring a frozen coffee drink back to the room for my treat, as I manage the kids’ getting to bed. Dear Husband works a little, then checks out the ship casino. I have some wifi time, but it is slow and we are monitoring our minutes. I limit myself to ten texts per day, so as not to incur overage fees with my cell phone provider. I am feeling quite disconnected from my family and friends. Tomorrow our port is Salerno. We have lined up a private tour for Pompeii and the Almalfi Coast. Have you been on a Mediterranean cruise? Tell me about it in the comments below!